If you’ve ever eaten chicken curry or cooked with curry powder, you’ve likely tasted ground turmeric root or rhizome, a slightly bitter and nutritious spice that doubles as a free radical scavenging herb with active compounds and antioxidant properties that have long been praised in the natural health world. Turmeric root and rhizome are the most commonly used parts of the plant for food or medicine. Those parts of the plant can be eaten raw, or cleaned, cured, boiled, dried, and ground into a fine powder for cooking or for use in nutritional supplements. Not only is it a delicious spice, but turmeric root and rhizome are popular ingredients in herbal supplements meant to support optimal health. The turmeric root and rhizome contain nutrients and bioactive compounds that are believed to support optimal health. According to Herbal Medicine, the main component of turmeric root is a volatile oil, containing turmerone, in addition to nutritional pigments called curcuminoids. Ayurveda values consuming a full spectrum of foods that resemble the colors of the rainbow to get diverse nutrients the body need to function optimally. It also suggests getting restful sleep, living in tune with nature, and living in tune with your body through positive choices and physical fitness. Today, turmeric is a common spice and a major ingredient in curry powder, alongside cumin and chili powder. In addition, the primary active ingredients in turmeric, curcuminoids, are yellow and used to color foods such as mustard, butter, and cheese, as well as some cosmetics. Many of curcumin’s potential health benefits are attributed to its antioxidant properties. Antioxidants help neutralize free radicals, which are highly reactive molecules with unpaired electrons that can damage DNA, cells, and tissues in the body. According to Herbal Medicine, turmeric root can be incorporated into meals with rice and beans to support digestion without unwanted side effects such as gas or bloating. It is also considered a cholagogue, stimulating bile production to support the body’s ability to digest fats. As the human body ages, it has less function in its vascular endothelium (the lining of blood vessels). When this lining is compromised, it may lead to an inability to regulate blood pressure and increase the risk for cardiovascular disease. Curcumin is believed to support healthy function of the vascular endothelium, which could support heart health. Turmeric can also be used as a poultice (cloth with herbs soaked in hot water) for use as a topical compress to help relieve joint pain or muscle strains. Turmeric supplements have not been studied in children, so there is no recommended pediatric dose. The turmeric plant usually only contains about 3% curcumin content, so to get the recommended daily dosage of curcumin, try taking a dietary supplement of turmeric root and rhizome that contains significant amounts of curcumin. 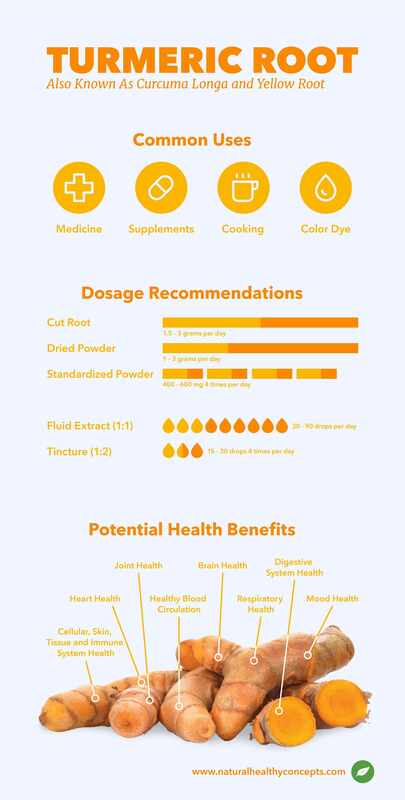 Curcumin has a relatively low bioavailability, which means it is poorly absorbed and rapidly metabolized and eliminated by the body, so it is generally regarded as safe. Be sure to look for supplements with bioperine (also called piperine), which supports the absorption (bioavailability) of curcumin by 2,000%. Or, shop for products with BCM-95, a 100% pure formula with a bioavailability 6.93 higher than normal curcumin formulas. You can shop for turmeric and curcumin supplements in most health food or supplement stores, including Natural Healthy Concepts. However, you should always take herbal supplements with care. Turmeric may not be safe for pregnant women or people taking certain medications. Talk to your healthcare provider before introducing turmeric into your diet.